Exploring tensions between the functional and aesthetic nature of the vessel, Botanicashowcases the work of seven contemporary makers, utilising a diversity of craft material and practice in collaboration with floral studio Cecilia Fox. 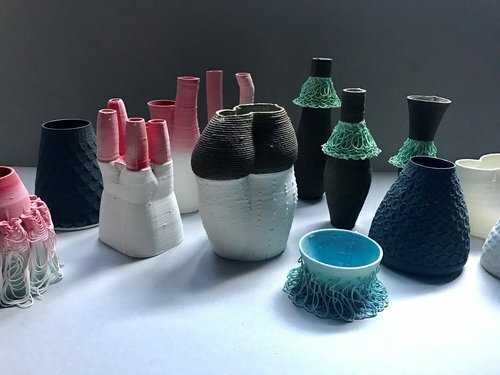 Jeweller and object maker ACV studio, ceramicist Sharon Alpren, 3D ceramic printers Alterfact studio and stone mason Den Holm, have created works which draw reference from the natural world and historical craft forms. This window also features the work of ceramicist Andrei Davidoff and Victorian Aboriginal Weaving Collective’s Donna Blackalland Glenda Nicholls. Exploring interactions between flora and form, Botanica servers as an immersive reminder of our connection to the crafted object and to nature.